Now, 14 years and four films later, the “Pirates” franchise has finally delivered exactly what cynics had expected all along. Containing only the faintest traces of the spark that turned this once unpromising idea into a nearly four billion-dollar enterprise, Joachim Ronning and Espen Sandberg’s “Pirates of the Caribbean: Dead Men Tell No Tales” is a mercenary, visually unappealing exercise in brand maintenance. The franchise has lost a bit of its luster with every successive installment, but never has a “Pirates” film felt this inessential, this depressingly pro forma. It will surely make money, and the estimated wait times for its namesake ride will spike in Disney parks worldwide. 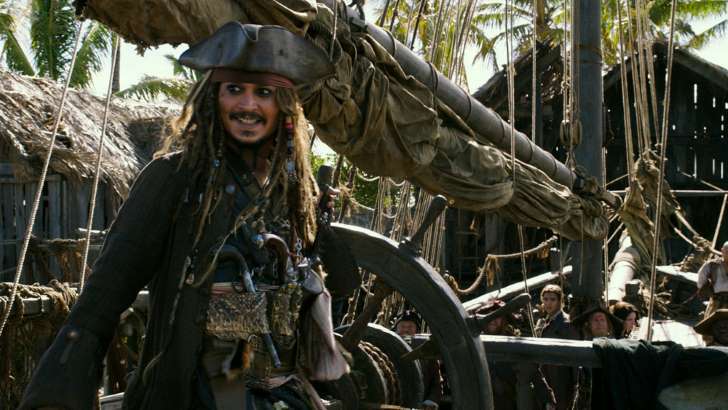 But considering the quality of some of the other big-money franchises in Disney’s fleet, “Pirates” needs to make a far better case for its seaworthiness if it expects to see future voyages. After the triumph of “Black Pearl,” the two Verbinski-directed sequels grew ever more bloated and obsessed with their own cod-mythology as they went; the fourth film, directed by Rob Marshall, reined in some of its predecessors’ more lumbering tendencies, yet seemed to leave the franchise with nowhere to go. Hence, the studio has resorted to a “soft reboot,” which in this case means mimicking the structure and story beats of the series’ first installment, with markedly diminished returns. Once again serving as both protagonist and comic relief, Johnny Depp reprises his role as drunken, dissolute, sporadically decipherable pirate Captain Jack Sparrow. His performance here is no better and no worse than in his previous two or three outings, though what once was a bracingly anarchic approach is starting to feel a bit old hat, like a standup comic rehashing vintage punchlines for cheers of recognition, rather than laughs. Once again, Sparrow begins the film attempting a heist, and subsequently facing imminent execution at the hands of some dour British soldiers. And once again, he makes the acquaintance of two straight-arrow youngsters. This time, his sidekicks are Henry Turner (Brenton Thwaites), son of the first trilogy’s Will Turner (Orlando Bloom) and Elizabeth Swann (Keira Knightley); and Carina Smyth (Kaya Scodelario), a defiant, proto-feminist astronomer accused of witchcraft. The film gives these two precious little to play, but considering their broad physical resemblances and virtually identical character types, it’s hard not to compare Thwaites’ and Scodelario’s performances to Bloom’s and Knightley’s in the first “Pirates,” and the comparison does them no favors. Succinct plotting has never been among the “Pirates” films’ virtues, so suffice it to say that all three have various reasons to seek the film’s central MacGuffin: The Trident of Poseidon, which has the power to undo curses. Standing in their way is a fearsome band of undead Spanish sailors lead by “el matador del mar,” Captain Armando Salazar (Javier Bardem), who is soon joined by Sparrow nemesis Captain Barbossa (Geoffrey Rush). Subjects of the film’s most striking visual effects, some of Salazar’s partially mutilated ghouls look terrifying, while others look like incompletely-buffered Playstation 2 characters. Lackluster as it is, “Dead Men Tell No Tales” is not an aggressively unpleasant time at the cinema. An early scene featuring an unusually literal bank robbery is well staged and entertaining, establishing a high watermark of spectacle that the film never again threatens to reach. The luminous Iranian actress Golshifteh Farahani hams it up enjoyably as a heavily henna’ed witch. Paul McCartney has a bit part as a pirate named Uncle Jack, which is fun in the sense that it makes you stop and think, “hey, that’s Paul McCartney.” Buckles are swashed, and do is derred. But rarely is one ever swept up in the sanitized pirate fantasy that used to be the franchise’s raison d’etre – indeed, were it not for the occasional wide shots of the digitally-sweetened ocean, it would be easy to forget the film even takes place on the water. This is strange considering Ronning and Sandberg’s previous film, the Oscar-nominated “Kon-Tiki,” was set almost entirely on a boat, skillfully relying on tiny sonic details and slightly off-kilter angles to suggest a life at sea. 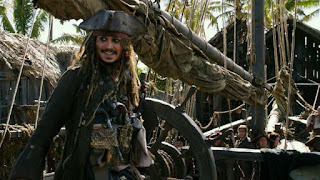 Strikingly little of that sensibility survives here: Shot in Australia, “Dead Men Tell No Tales” rarely appears to be taking place anywhere other than a soundstage, featuring pirates posed against unnaturally hued skies, and a foggy color palette that ranges from gray to slate, gunmetal, granite, and ash. One hopes the directors plundered enough booty on this excursion to quickly get back to what they do best. As for the series, it’s taking on water fast.